My work explores the vessel form on a human scale, taking simple pottery forms and jumping them up in scale as a vehicle for abstraction. Though my work only alludes to function through the context of the vessel, I am trying to make pots that speak to a "body" reference. This ”body” scale speaks on a subliminal level to the entire histories of our experience. 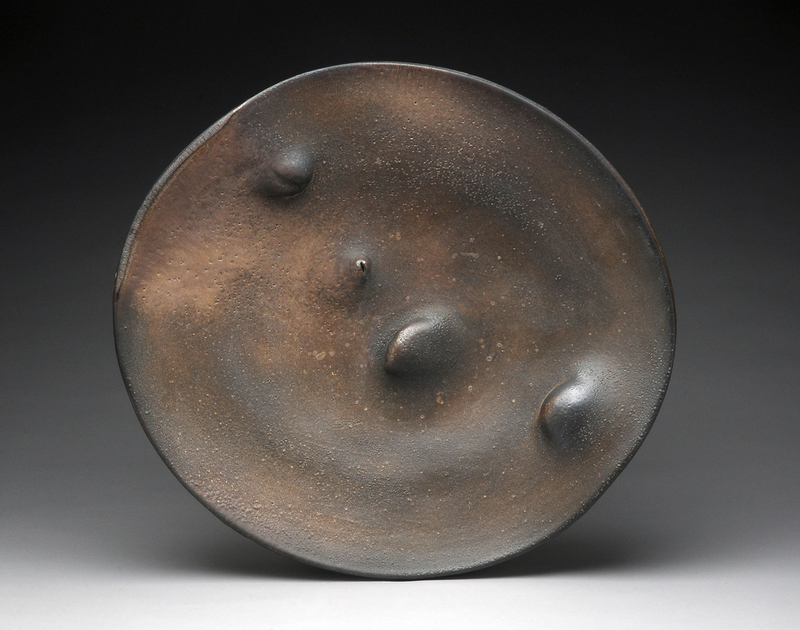 The surfaces inherent in wood firing that come as a result of the heat, flame, glaze and ash all add a sense of “skin” to the surface of the clay, giving it an almost organic sensibility that plays with the form. How that “skin” holds the interior space of the pot, and how I manipulate my forms "around" that space, constraining it, enclosing it, or letting it expand and swell, can allow analogy and metaphor to enter into the work. I don't want my pots to conjure up a singular image for the viewer. By inviting the hand to explore the forms as well as the eye, I want to provoke numerous memories, recollection that has the potential to change from moment to moment, provoking connections that go past the intellectual to the innate. By using forms that evoke generosity, sensuality, fullness and humility, I am asking the viewer to make connections on a deeply personal level. This is what I depend on: the desire in all of us to reach out and touch, and by doing so, to trigger memory that is both felt and connected, memory that quietly waits to come to consciousness. This innate connection is for me the primal language of ceramic vessel form. It has the potential to reflect our universal human story, regardless of politics, culture or history. Chris Gustin’s studio is a workshop, laboratory, exhibition space, and study, housed in a renovated chicken coop. The multi-use space speaks to his multifaceted approach to art making. Gustin is a renowned artist who has developed a specific aesthetic language over nearly forty years of professional practice. 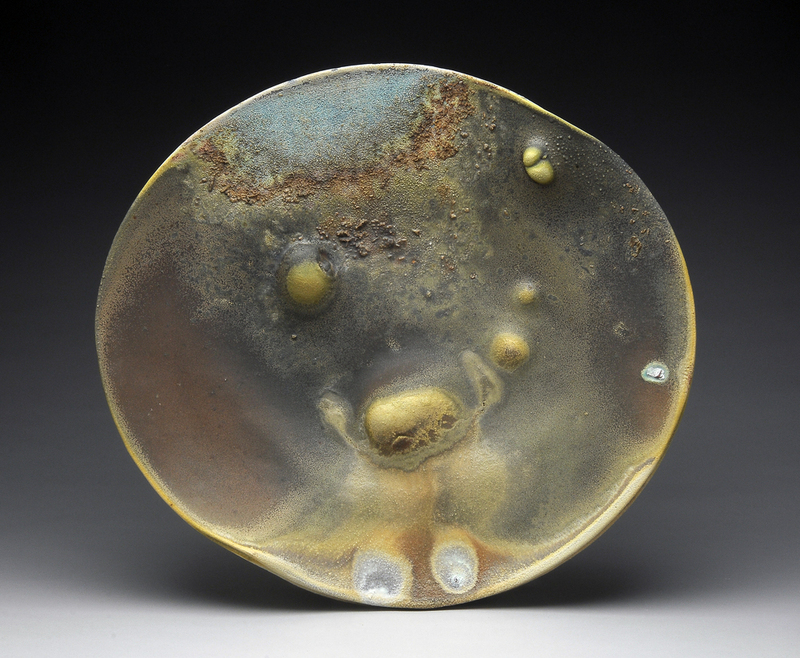 He is also a mentor for aspiring ceramic artists and an organizer of our local ceramics culture. He is a cofounder of the Watershed Center for Ceramic Arts in Maine. He hosts regular community firings in his massive Anagama kiln in his studio, and shows his own work and the work of other artists in the gallery space attached to his workshop. Known for his graceful undulating forms, ambitious scale, and beautiful organic layered glaze techniques, Gustin has become a household name in the ceramics world. Growing up exploring the ceramic tile factories of his family’s commercial ceramic manufacturing companies, Gustin had an early connection to the material and process of ceramic making. 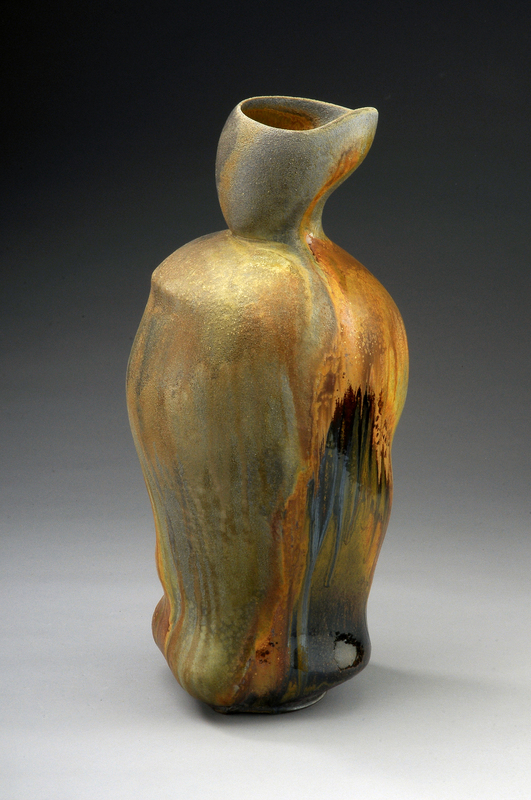 He received his BFA from the Kansas City Arts Institute and his MFA from the New York State College of Ceramics at Alfred University in 1977, and launched into a distinguished career of exhibitions, prizes, residencies, grants and publications. Gustin’s CV is extensive and impressive, but it doesn’t encompass the impact he has on our local art scene and community. Chris Gustin is one of the stand-out local artists that inspired Dedee to open her gallery in Westport four years ago, we have long anticipated a solo show of his influential work. Gustin’s captivating work transcends the materiality of clay and glaze. His works have a soulful presence, a lifelike feeling. His vessels, though abstract, have strong references to the figure. Gentle curves are punctuated with soft edges and creases, as bone might push against skin, or heavy flesh might fold over itself. He often works on a scale that is nearly human sized. Working on this scale presents a set of challenges for a ceramic artist, but Gustin’s doesn’t shy away from the challenge. Approaching a clay vessel that relates to a viewer’s own size creates a strong emotional connection and a memorable experience for viewers. 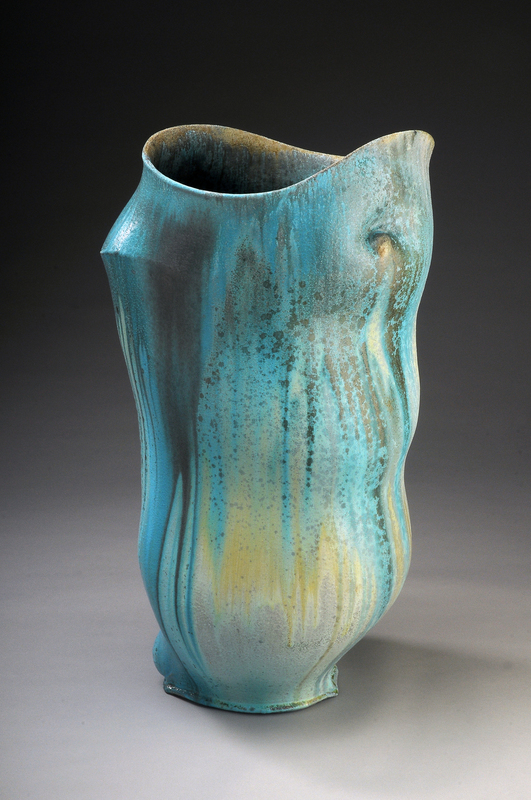 Gustin might be as well known for his mastery of glaze techniques as for his poetic work with form. Over four decades of careful experiments, he has developed the proficiency of a chemist. 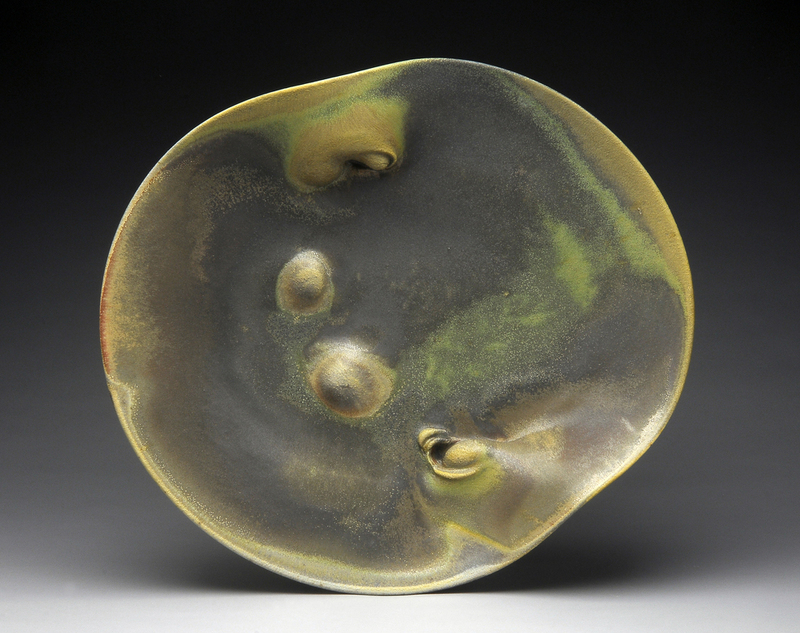 In his practice, Gustin layers and mixes glazes so that they react and interact in surprising ways in the kiln. The resulting surfaces are sometimes rough and pitted, velvety and ethereal, or have crystalline pools of glaze settled into clay depressions. The process is a balance between chance and control. This exhibit, Slow Breath, celebrates Chris Gustin’s distinguished career and artistic excellence. We exhibit a collection of vessels, platters, and objects that show a range of Gustin’s expertise and conceptual experiments. We are pleased and honored to host this exhibit as our opening show of 2015.